Monday 27th November – inclusive, the value of the Cash back awarded will be doubled". I was contemplating the x-t20 as a lighter weight alternative to my existing setup of a Canon 6D and the usual selection of heavy L lenses that @m just not using as it's too heavy to take everywhere. Anyone made the similar move? Will it be a significant weight saving? I was contemplating the x-t20 as a lighter weight alternative to my …I was contemplating the x-t20 as a lighter weight alternative to my existing setup of a Canon 6D and the usual selection of heavy L lenses that @m just not using as it's too heavy to take everywhere. Anyone made the similar move? Will it be a significant weight saving? I had the X-T10 and then recently upgraded to the X-T20. 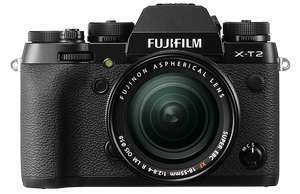 An amazing camera with most of the features and tech from the X-T2 (remember it doesn't have weather proofing). That's the reason I went for the X-T20 due to the size. If you get a nice strap (these are lovely BTW 1901fotografi.co.uk/sho…rap) you don't really notice it's there. I've got the main prime lenses too (23mm f2, 35mm f2, 50mm f2). The 35mm is the one I tend to keep on there most of the time. Just weighing mine now with battery, 50mm lens etc etc and it comes out at 622g. I absolutely love this camera. Cheers for that I was originally looking at the x-t20 and 622g is less than the body for the cannon. I might have to nip to a store and compare the t20 and the t2. Cheers for that I was originally looking at the x-t20 and 622g is less …Cheers for that I was originally looking at the x-t20 and 622g is less than the body for the cannon. I might have to nip to a store and compare the t20 and the t2. Yeah, definitely worth seeing them side by side. You may find the X-T20 a bit too small if you're used to the 6D but that said you wanted to get away from that due to its size and weight. Either way, the quality of the pics is incredible on both. Went to look at the x-t20 and x-t2 in John Lewis last night and didn't find the interface very intuitive at all. Shame as they both get great reviews and feel really well built. Went to look at the x-t20 and x-t2 in John Lewis last night and didn't …Went to look at the x-t20 and x-t2 in John Lewis last night and didn't find the interface very intuitive at all. Shame as they both get great reviews and feel really well built. It’s like anything. You just get used to it. A great feature is all the physical buttons around the main menu button are customisable so you can assign whatever function you like for quick access.